In the parable, Jesus doesn't say, "Pay attention, the Pharisee's God is a lie, but the tax collector's God is true God." He doesn't say, "Make sure your worship is as sincere and heartfelt as this tax collector." Jesus doesn't say, “You’ve been doing it wrong the whole time. But, here’s how to get this religion thing right.” Instead, Jesus warns us that we need to drop dead to all our religious beliefs. We need to drop dead to all the stuff we hold up that justifies our life to God. God has no use for any of that. Instead, in the parable, Jesus points us to the whole point of the Gospel: faith in a God who finds the lost, strengthens the weak, and raises the dead. In this parable, Jesus says that none of our goodness is good enough to pass muster. Likewise, none of our badness is bad enough to propel us outside Jesus' death for sin. God isn’t going to let us take our mess of a life into eternity, or our plans to control our life, or our doomed attempts to save ourselves. The only thing God will accept, the only thing that will get us into the Supper of the Lamb without end, is our deadness that is swallowed up by the power of Jesus’ resurrection. That's why Jesus condemns the Pharisee. It's not that he has the wrong God, or wrong kind of worship, or a backward religious attitude. The point of the parable is that the Pharisee takes his stand on a life God can’t use. On the other hand, Jesus commends the rotten tax collector. This man rests his case on a death that God can use. The tax collector is a mafia-style enforcer. He is a thug and a deadbeat. He is dead in sin. But, this just means he’s a prime candidate for a resurrection, for new life. Of course, the Pharisee and tax collector are both dead in sin. But so long as the Pharisee refuses to confess he’s dead in sin (and all his supposed goodness is bad news to God), he’ll never be able to believe this truth about himself. He’s so busy with bookkeeping, keeping accounts of every good work and bad choice, he doesn’t notice that, in Christ, God’s given up on accounting. And as much as he tries to keep up on the good that justifies him and the evil that damns others, the Pharisee’s bookkeeping keeps disappearing off the page. But, the tax collector goes home justified. He's confessed that all he has to offer God is sin and death. No impressive lists. No plan to reform his rotten life. No idea about how to get right with God. Nothing that we might call “good.” Nothing that puts us at ease about how God will judge his badness. Nothing that says, “This is why God justified him.” All we are left with is the tax collector's sin and God’s love for rotten sinners. That's why, down deep, we hate this parable. It reveals the nightmare truth about each of us. We are afraid to celebrate the tax collector's justification because we know people who are just like him. Worse yet, we know that we are just like him too. Jesus doesn't let anyone off the hook. We may come to church with the words of the Pharisee in our mouth, but in our heart, we are as rotten as they come. Each of us is a dead ringer for THE sinner. Jesus came to save sinners, of which each one of us is the worst. We are all THE sinner. But, before we get too upset, this isn’t a sad confession. This isn't something intended to shame or embarrass us. This isn't something to mumble about under our breath. It’s a confession that praises the God who seeks and saves the lost. He strengthens the weak. He died for us deadbeats. It's a confession that praises the Savior who was raised from the dead for us who are dead in sin. This is a confession that offers comfort and certainty in life and in death, today and always. 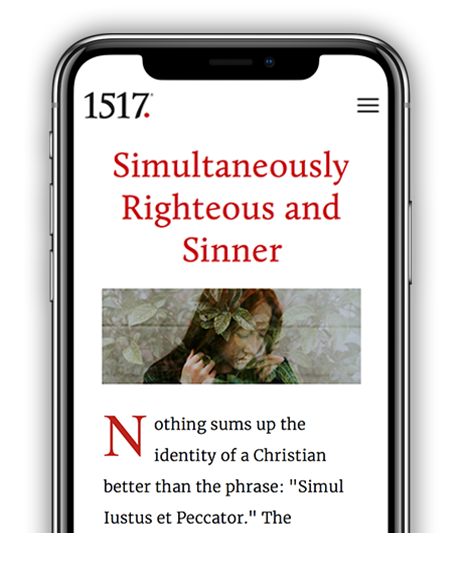 Donavon Riley is a Lutheran pastor, conference speaker, author, Online Content Manager for Higher Things, a contributing writer for 1517, Christ Hold Fast, and LOGIA. He is also the co-host of The Banned Books podcast and the As Lutheran As It Gets podcast.